Within a short distance of each other, near and on 15th Street East in Tuscaloosa, there is a concentration of several antique vehicles being used as advertising. The antique (reproduction?) Krispy Kreme truck sits on the grassy area in front of the doughnut store on McFarland Blvd., just before you get to 15th street, going south. 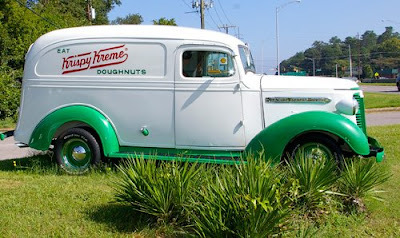 The truck is parked in front of the large Krispy Kreme sign that flashes "Hot" and "Now" whenever the freshly made yeast donuts are making their way down the conveyor belt towards the waterfall of sugar glaze. It is the least creative in terms of ad copy with only: "Eat Krispy Kreme Doughnuts" painted on the side. 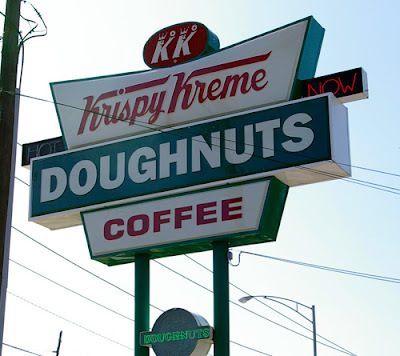 But Krispy Kremes are so good that's really all you need, especially when the "Hot" "Now" signs are flashing. 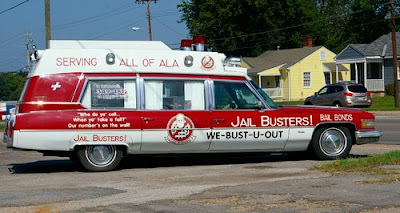 A little over a block from Krispy Kreme on 15th Street is the Jail Busters antique ambulance. 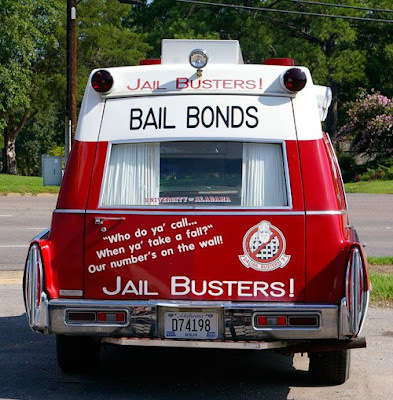 The ambulance is the most unusual vehicle of the three and the spoof of the "Ghost Busters" movie adds a humorous tone that their bail bonds customers could probably use plenty of. In addition to the catchy slogan "WE-BUST-U-OUT", the ambulance asks, "Who do ya' call... when ya' take a fall? Our number's on the wall." Indeed their phone number is painted on the wall of the small brick building in back of the parking lot. A block from Jail Busters, across the street from Forest Lake, is another emergency vehicle - the Signature Loans fire truck. 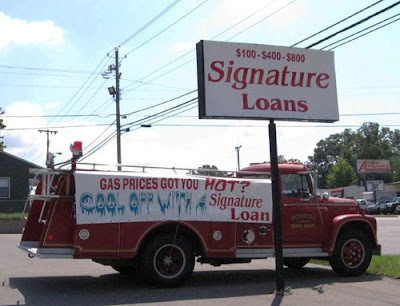 "Signature Loans Fire Dept." is painted in gold letters on the cab doors and the somewhat ominous "Warning: Ride At Your Own Risk" is painted on the back of the truck. A printed banner is attached to the sides and asks people driving on 15th Street the $100, $400 or $800 question: "Gas Prices Got You Hot?" And provides the answer: "Cool Off With A Signature Loan." Note: With the exception of being an occasional Krispy Kreme customer, I have no present or planned affiliation with any of these businesses.